Looking for engaging ways to build your students’ number knowledge? 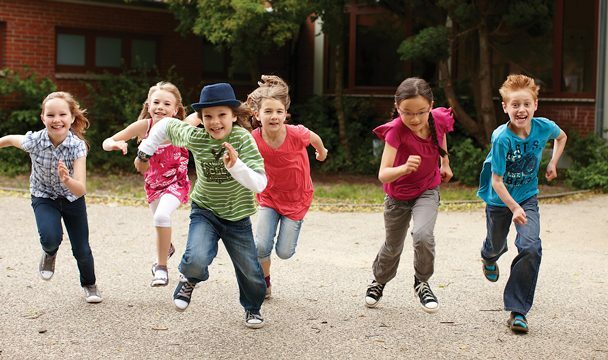 Try these quick and easy brain breaks to energize your students – while reinforcing basic math facts. This is a counting game that focuses on skip-counting and multiples. Identify a multiple you want to practice. Have students stand in a circle and begin counting off in turn from the number one. When a number in that sequence is reached – the student says their number followed by the word ‘BUZZ’, and then squats down. The goal is to move around the circle as quickly as possible without making a mistake – until no one is left standing. Once a student squats down, they are out of that round. If a student forgets to BUZZ the number, reset the game and start back from one. Practice using different series of multiples OR mix your students up and play the same game again. Ex. If you are practicing multiples of three, your game will start like this: 1, 2, 3-BUZZ! (student squats down), 4, 5, 6-BUZZ! (student squats down), 7, 8, 9-BUZZ! (student squats down) etc. Try variating the game by playing with more than one multiple at a time or counting backwards in sequence. You could also modify the structure of the game by having the student after the word ‘BUZZ!’ squat down. This game is a maths exercise that focuses scale and skip-counting. It encourages students to get moving while thinking about numbers. Determine the number sequence you want to practice; this may vary depending on age level. Start with something easy like one to ten. Everyone stands in circle touching their toes. When the counting begins, students slowly straighten their bodies, keeping their arms straight out in front of them. At five, students should be halfway with their arms straight out in front of them. At ten, all arms should be pointing directly overhead. Repeat using different number scales or skip-counting sequences. Encourage visual memory, by calling out different numbers and having students reposition their bodies to show it on the ‘number line’. Pro-tip: Coach students to think about where their bodies should be when they reach the halfway point in any number sequence. Does the number have ____ digit(s)? Is there a ____ in the ten/ones place? Is the number higher/lower than ____? Is the number a multiple of ____? Play energetic music, and instruct players to mingle and move around the room. When the maestro stops the music, he/she will call out a number – which cues students to form quick groups of that size. For example: *Music stops. * Maestro says, “4!” And students quickly move to make groups of 4. Once players are in their groups, they begin to play ‘Elevens’. Students stand in a circle without talking – using only body language (similar to Rock, Paper, Scissors) to count with one hand. They bounce their fist to count 1, 2, 3, and then on the 4th count, students throw their chosen number of fingers on their hand. Players count or add all the fingers in the circle to see if they made eleven altogether. If not, they keep going until they do – and then their group squats down to show they completed the round. When the maestro is ready, the music starts again, and students repeat the process in different sized groups. Variation: Make the target number higher or lower. These simple math games make great energizers and warm-ups. The more you play them, the more fun they become! What fun math games get your kids moving? Tell us in a comment below – we’d love to hear!